One of the major problems with anime clothing merchandise is, aside from t-shirts, the lack of it. Most of the limited edition items, such as trainers, are only available in Japan and sell out quickly. It is unusual for a limited-edition anime apparel available by a household-name manufacturer to be available in the UK, so imagine my surprise when I saw Speed Racer trainers in the shop window of the Puma store in Carnaby Street. Given the huge amount of merchandise that accompanied the release of the flop film which they were based on, I was expecting these trainers to be shoddily-made and aimed towards children. I was therefore surprised to find that not only were they stylish, but also available in adult sizes 6-11. 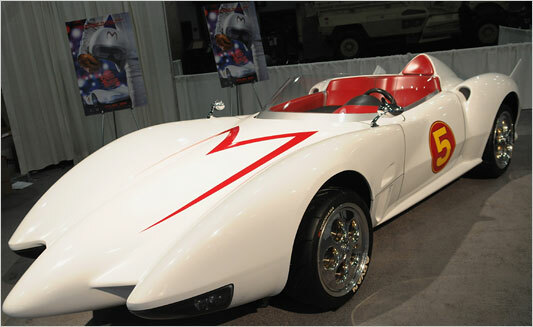 The trainers are modelled on the Mach 5 car which features in Speed Racer, rather then the easy option of the logo or an array of characters. Given that the Mach 5 is an anime icon, recognisable to those who have never seen Speed Racer, this is a wise decision. Featuring the iconic 'M' symbol from the car, the '5' on the side of the shoe and the film logo on the heel, the design is striking but does not cry out 'based on failed film'! In fact the design element which stands out more then anything is the trademark Puma logo, which is in a reflective silver. The sole of the shoe is made from rubber at the ball and heel, with the leather upper running through the middle. Rather then review these fresh out of the box, I have been wearing these trainers for over a month and have found them to be excellent. They are very comfortable to wear and, worn with the right clothes, look very stylish. The only downside to these trainers is that it could be considered misnomer to describe them as trainers. I say this as when worn for long-distance walking or jogging, they become uncomfortable on the heel so cannot be used for 'training' as such. These are lifestyle trainers, worn for fashion rather then sport. Do not expect them to suit any physical training conditions. If you are planning to wear these solely for fashion purposes, then they cannot be faulted. As a shoe they are fulfil all the purposes a shoe should fulfil - they are comfortable, made from durable materials and are well made. Whether you agree with the design is a personal choice. Granted I am a massive fan of Speed Racer, but I have shown these shoes to people who are not fans of anime, let alone Speed Racer and they have loved them. They loved because the design is different, but not too different. If you are after a piece of anime clothing/apparel that isn't a t-shirt, then these could be the product you are looking for. 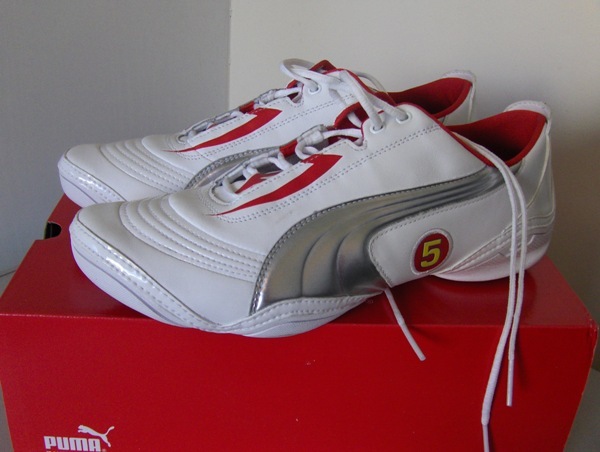 Given that they are a limited-edition the price is reasonable not just because they are limited, but also as they are well-made and a similar price to other Puma trainers. Until a working replica of the Mach 5 goes on sale, these trainers are the ultimate Speed Racer merchandise available and an understated yet practical way to show others your fandom. Go Speed Racer! Well being a pair of trainers I wasn't expecting much and I didn't get much. 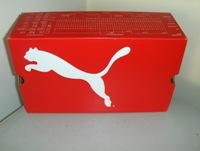 They come in a standard Puma shoebox with the usual pack silica gel thrown in. Would have been nice to have them packaged in a special Speed Racer box, but never mind.